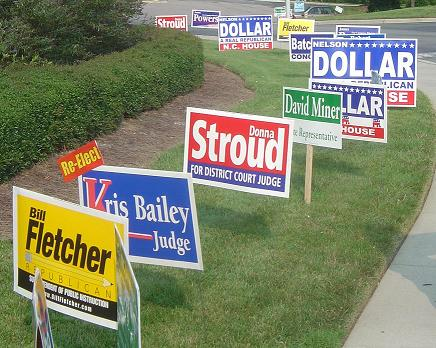 Kansas law overrides neighborhood covenants that prohibit political yard signs before elections. Some neighborhoods have restrictive covenants that prohibit homeowners from placing any signs in their yard except signs advertising homes for sale. But a 2008 Kansas law overrides these restrictive covenants to allow for the placement of small political yard signs starting 45 days before an election. Still, residents of covenant neighborhoods may want to observe their neighborhood’s restrictions. The bill was the product of then-Senator Phil Journey of Haysville. The bill passed unanimously in both the Kansas House and Senate. According to the First Amendment Center, some 50 million people live in neighborhoods with homeowners associations. And laws like the 2008 Kansas law are not without controversy, despite the unanimous vote in the Kansas Legislature. While the U.S. Supreme Court has ruled that governmental entities like cities can’t stop homeowners from displaying political yard signs, a homeowners association is not a government. Instead, it is a group that people voluntarily enter. Generally, when prospective homeowners purchase a home in a neighborhood with restrictive covenants, they are asked to sign a document pledging to comply with the provisions in the covenants. If those covenants prohibit political yard signs, but a Kansas law says these covenants do not apply, what should a homeowner do? Should state law trump private contracts in cases like this? Practically: Should you display signs in your yard? While Kansas law makes it legal for those living in communities with covenants that prohibit political yard signs, residents may want to observe these convents. Here’s why: If neighbors are not aware of this new Kansas law and therefore wrongfully believe that the yard signs are not allowed in your neighborhood, they may think residents with signs in their yards are violating the covenants. By extension, this could reflect poorly on the candidates that are being promoted. Those who are not aware of the law allowing yard signs are uninformed. Or, they may be aware of the law but disagree with it and wish their neighbors would not display political yard signs. These people, of course, may vote and influence others how to vote. Whether to display yard signs in a covenant neighborhood is a judgment that each person will have to make for themselves. K.S.A. 58-3820. Restrictive covenants; political yard signs; limitations. (a) On and after the effective date of this act, any provision of a restrictive covenant which prohibits the display of political yard signs, which are less than six square feet, during a period commencing 45 days before an election and ending two days after the election is hereby declared to be against public policy and such provision shall be void and unenforceable. (b) The provisions of this section shall apply to any restrictive covenant in existence on the effective date of this act. Previous PostKansas school employees by typeNext PostWho decides? When it comes to planning, is it the people, the politicians, or the bureaucrats? When I purchased the house I now live within, I signed a covenant promising many things. One was that I would not junk up the neighborhood with political signs. Since then the law says I can do the sign thing. That doesn’t change the fact that I agreed with and made a promise to my neighbors that I would not display political signs. It’s about honor. I will keep my promise. Rated worst Sedgwick County judge in four consecutive polls, Journey is an embarrassment to the Court. It gets down to , political signs are covered by free speech under the Constitution, and no contract can be contrary to it. My opinion, but there are court cases supporting that as well. People need to get over it.